Juan Carlos Caballero-Perez knows every metal artist is inspired. After all, he’s one of them. 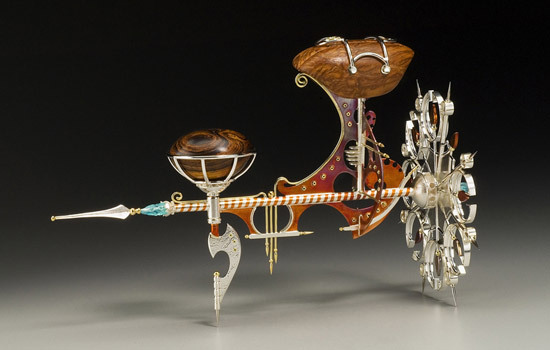 He’s also a professor and alumnus—’94, ’01 (metalcrafts and jewelry, MFA) from the School for American Crafts at Rochester Institute of Technology. Caballero-Perez says the Metals Alumni Exhibition, which makes its debut at RIT’s Bevier Gallery this month, will showcase national and international artists who have graduated from the RIT program and have achieved recognition and success for their work. An opening reception will be held from 5 to 7 p.m. on Dec. 10, and the show runs through Jan. 19. Bevier Gallery is closed Dec. 18 to Jan. 2. Caballero-Perez says the exhibition is a standard of excellence for RIT students who will graduate from the program. Bevier Gallery is handicapped-accessible and is located in James E. Booth Hall on RIT’s Henrietta campus. Gallery hours are 9 a.m. to 4:30 p.m. Monday through Friday; 7 to 9 p.m. Monday through Thursday; 1 to 4:30 p.m. Saturday; and 2 to 4:30 p.m. Sunday. All exhibits are free. For more information, call 585-475-2646.